A group of 150 Syrian intellectuals, composed mostly of writers, artists, academics, and journalists, all identifying themselves as secular democratic opponents of the Syrian regime, have issued the statement below to express their condemnation of the role played by both Washington and Moscow in their country. The signatories include globally known figures such as Paris Sorbonne professor Burhan Ghalioun, who was the first chairperson of the Syrian National Council in 2011-12; award-winning novelist Samar Yazbek, whose works are published in many languages; famous Syrian intellectual Sadik Jalal Al-Azm; Farouk Mardam-Bey, a writer who edits the most important collection dedicated to the Arab world in France; playwright Mohammad Al-Attar; and Yassin al-Haj Saleh, a prominent independent voice in the Syrian opposition. We the undersigned are democratic and secular Syrian writers, artists, and journalists who have opposed the tyrannical Assad regime for years, even decades. We are participants in the struggle for democracy and justice in our country, our region and in the world. We unreservedly, and in the strongest language, condemn the Russian and US approach of intervening in our internal Syrian affairs. At least since 2013, these two powers have been working to co-opt the Syrian liberation struggle under the rubric of the “war against terror.” This is a war that has failed to score a single success since its outset, and has led instead to the destruction of a number of countries. Three years ago the two imperialist nations signed a reprehensible deal on chemical weapons that resolved a problem for the United States, Israel, and Russia, and even for the Assad regime, which had just murdered 1,466 of its subjects. The deal however did not resolve any of the problems facing the Syrian people. Rather it gave free rein to an extremely criminal regime that kills Syrians, destroys their villages and communities, and drives them into exile. The deal has also proved to be a priceless gift to Islamist nihilistic groups like Daesh and Jabhat an-Nusra. Three years into this contemptible deal—with the death count now at around half a million Syrians—Russians and Americans have agreed to freeze the current situation so that the two military powers can carry on their endless war against terror. The agreement remains silent on the untold number of detainees held in brutal conditions, and includes no call for lifting the blockade on besieged areas, or the withdrawal of Iran, the Hezbollah militia, or any other sectarian militia. It is also devoid of any reference to the concept of a new and democratic Syria. Nor are the warplanes of Bashar al-Assad restrained from bombing areas that will ultimately be the subject of a later agreement between Russia and the United States. Not only does this show complete lack of a moral sense of justice on the part of the Russian and American negotiating teams, it also exposes the degradation of politics and the lowly level of officials in the two most powerful nations in the world today. Our feelings of anger over these agreements and their authors know no bounds. And we reject them absolutely. We are also disappointed in the United Nations, angered that, as was recently revealed, it has been financing the criminal oligarchy of Assad and his cronies throughout their war against the Syrians. As Syrian writers, artists, and journalists, we see the world today heading toward an unprecedented numbing of ethics. Levels of fear and hatred escalate in parallel with the increasing visibility of politicians who invest in the same feelings of fear, hatred, and isolationism. We see democracy in retreat around the world, while surveillance, control, and fear are rife and advancing. We do not believe that our fate is defined by these conditions, but rather that these are a result of dangerous choices taken by dangerous political elites, and that we must work together to voice our opposition to them, right now and wherever we may be. A destroyed Syria is the symbol of the state of the world today. The Syrian revolution was broken against the solid wall of the international community, and not only against the wall of the forces aligned with Assadist fascism. This international community allows politicians like Obama and Putin, along with their agents and clones—people lacking all sense of humanity—to take decisions that violate our right to self-determination, as individuals and groups but also as a nation. We have not elected them, and we have no access to any mechanism that can call them to account. This is an unfair system that fiercely opposes democracy. Therefore it must change. Unfortunately, there seems to be too little awareness of how hazardous reality has become. Many, especially in the West, prefer to hide behind fatalistic theories steeped in religion or culture—when they do not attribute events to climate change. This explains why a bad situation has become much worse, but it also absolves the powerful elite, including Bashar al-Assad and his gang, of their political responsibilities. This world must change. In just five and a half years, it has allowed the destruction of one of the most ancient cradles of civilization. 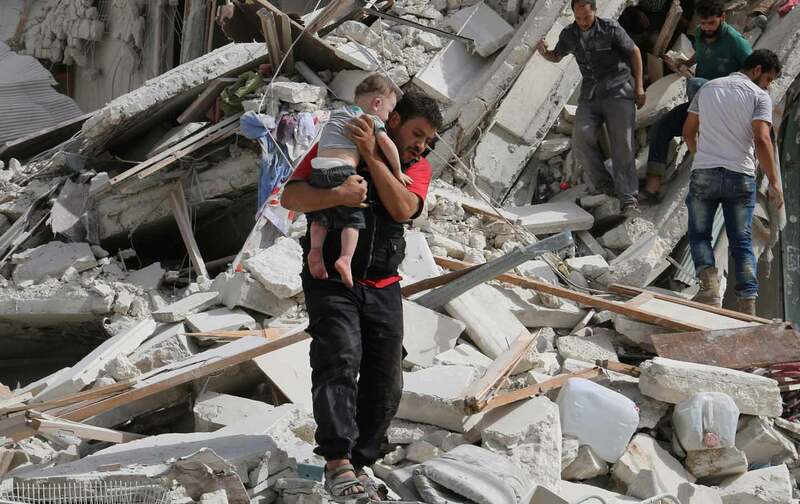 The world today is a Syrian problem, just like Syria today is a world problem. And for the sake of this world, for all our sakes, we call for the condemnation of the politicians responsible for this disaster and for their exposure as nihilistic murderers and terrorists, similar to their arch-rivals in the Islamist nihilistic camp. Syrian Writers, Artists, and Journalists Against US and Russian Policies in SyriaThis is a group of 150 intellectuals, composed mostly of writers, artists, academics, and journalists, all identifying themselves as secular democratic opponents of the regime of Bashar al-Assad.